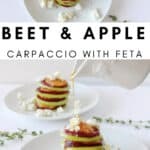 Beet & Apple carpaccio with Feta and a French vinaigrette. Simple. Elegant. It makes a statement just by looking at it. 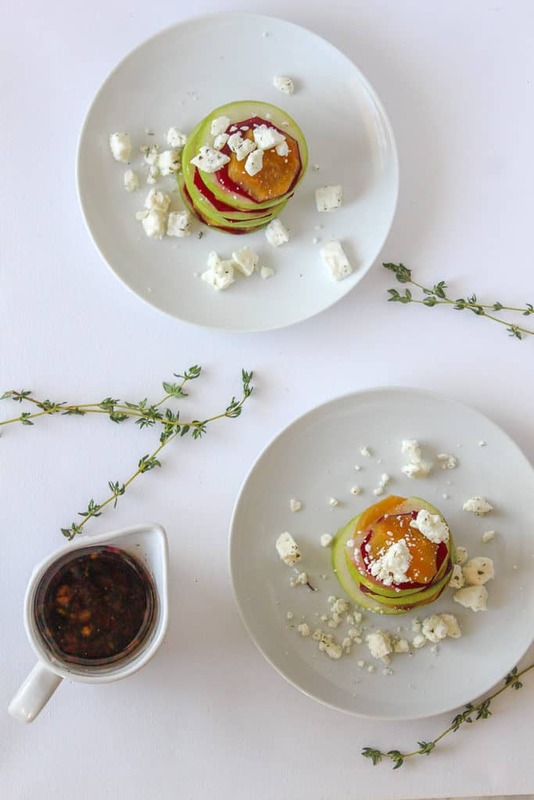 Above all, some winter fruit and veggie create the ultimate colourful and irresistible appetizer plate. The beet colours are vibrants and their sweetness pair perfectly with the sourness of the apple. 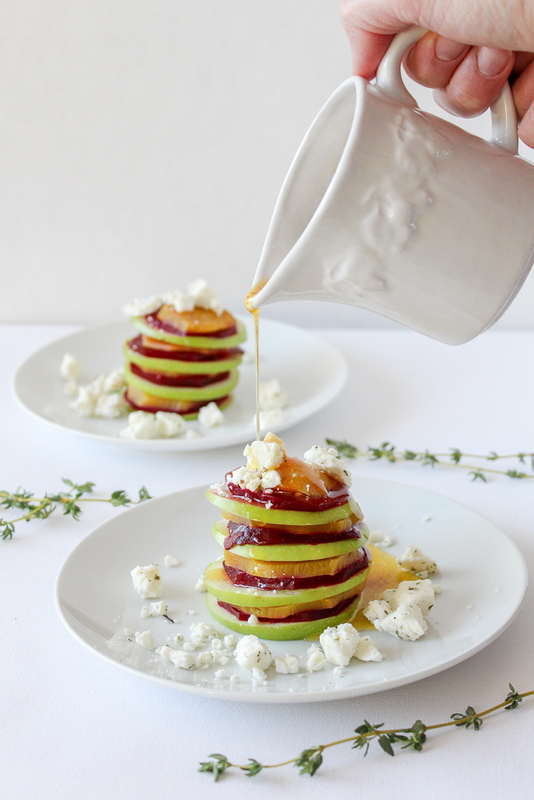 From the top of this topsy turvy tower of flavour, sprinkle some Feta and delicately pour some French vinaigrette. It’s simple, some olive oil and red wine vinegar, salt and some chopped red oignon. You can also put shallots too but I have red onions more often. Also, don’t forget: The ratio for olive oil/vinegar is 3 for 1. Then add salt and pepper to taste. This is THE dressing you need to know by heart. It’s easy, quick and pairs to most of your dish. 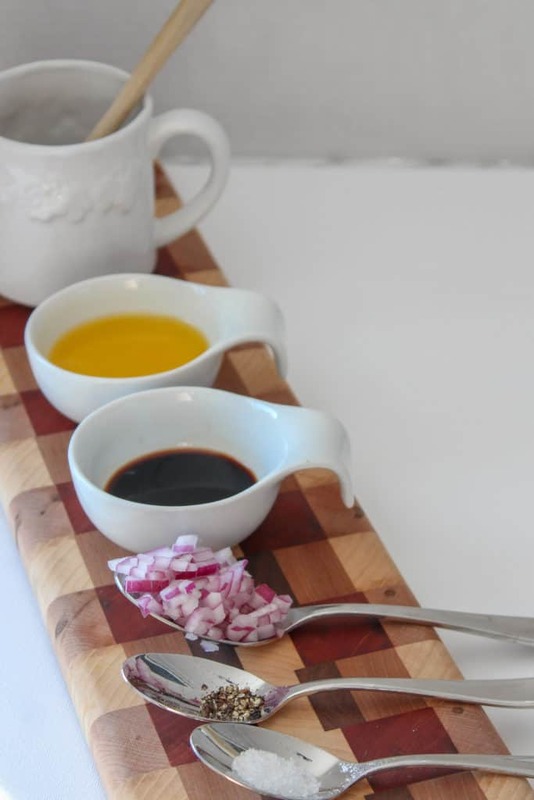 You can substitute your red wine vinegar for balsamic vinegar. Still delicious! Colours: I used yellow and red beets to create some contrast. In addition to that, the green apple is also standing out. Presentation: Nothing elaborate but the simplicity of some heigh in your plate. Difficulty: None. Absolutely none. Nada. This could a dish your little hands help you prepare if you wish. Nonetheless, look at this plate? It’s so pretty! Let’s be practical here, this is also a lunch for work. Two hard boiled eggs and you are good to go! Still practical, this is the lunch idea for your vegetarian friend. Vegan friend? Substitute the feta for some seeds, maybe some hemps and pumpkin seeds? This remind me of a quinoa crust tart I had made for a gluten free and vegetarian friend I had over for lunch. The picture does not give justice to the dish, it was delicious. In 2 separate pots, cook your beets in water for 1 to 1 and half hour depending on the size. Put your knife through it, it should feel like soft. Allow to cool. In the meantime, wash your apples. Cut beets and apples in horizontal thin slices. Build you ‘tower’ by alternating the yellow beet, red beet and apple. Vinaigrette: Mix all the ingredients together. This sounds and looks wonderful, Melanie. I am always on a lookout to add to my Vegan/vegetarian repertoire. Thank you for sharing. Wow – this is one of the coolest looking dishes I’ve ever seen – just gorgeous! And it sounds just as delicious!